Many ordered the flags lowered prior to the White House's decision. Democratic and Republican governors from around the country have ordered flags lowered to half-staff in remembrance of the late Arizona Sen. John McCain, many before the White House ultimately relented in the face of criticism following the decision to raise the flag less than 48 hours after McCain's passing. Ohio's Republican Gov. John Kasich, a primary opponent of Donald Trump during the 2016 presidential election, tweeted Monday on the decision to raise the flags at the White House to full staff, calling it "Shameful." Kasich is one of a growing number of governors who have ordered flags at half-staff until McCain's funeral, which is planned for this weekend. (Brian Snyder/Reuters, FILE) Republican presidential nominee Senator John McCain listens as he is introduced at a campaign rally in Fayetteville, N.C., Oct. 28, 2008. "In honor of the life and service of U.S. Senator John McCain, I hereby proclaim, by the authority vested in me as Governor of the State of Ohio by the Ohio Constitution and the laws of the United States of America, that the flags of the United States of America and the State of Ohio shall be flown at half-staff upon all public buildings and grounds throughout the state of Ohio, effective immediately through the day of interment," read an order released by Kasich Monday. Following criticism of the decision to raise the flag, President Trump issued a statement saying he would lower the flag until McCain's burial. "Despite our differences on policy and politics, I respect Senator John McCain’s service to our country and, in his honor, have signed a proclamation to fly the flag of the United States at half-staff until the day of his interment," President Trump wrote in a statement released Monday. Rick Davis, a spokesman for the McCain family, said that the focus should be on remembering McCain's life and legacy. "The entire focus of the McCain family is on John McCain. There really is no room in the McCain family to focus on anything today but him," Davis said at a press conference Monday. "There’s lots to celebrate, there’s lots to mourn, and I think any discussion of what any individual has done or said...If you look at the gravity of all the reactions from around the world, world leaders, our allies, it’s been immense, and I think they choose to focus on that." 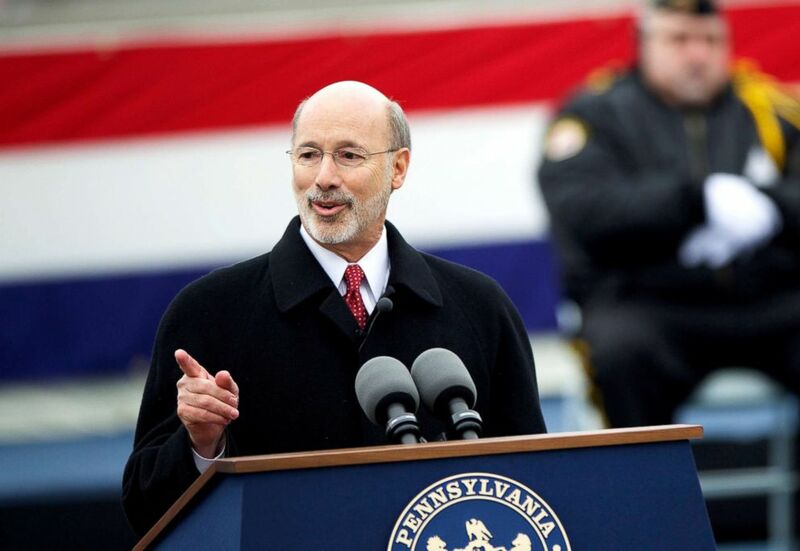 (Mark Makela/Reuters) Tom Wolf delivers a speech after being sworn in as the 47th Governor of Pennsylvania during an inauguration at the State Capitol in Harrisburg, Pa., Jan. 20, 2015. Among the Democratic governors who have specifically said they are lowering flags to half-staff through McCain's burial are Colorado Gov. John Hickenlooper, Connecticut Gov. Dannel Malloy, New York Gov. Andrew Cuomo, Rhode Island Gov. Gina Raimondo, Pennsylvania Gov. Tom Wolf and Virginia Gov. Ralph Northam. "I’ve ordered the flag of the Commonwealth of Virginia to be flown at half-staff over the state Capitol and all local, state, and federal buildings and grounds in the Commonwealth in respect and memory of Senator John McCain until sunset, September 2," Northam tweeted Monday. I’ve ordered the flag of the Commonwealth of Virginia to be flown at half-staff over the state Capitol and all local, state, and federal buildings and grounds in the Commonwealth in respect and memory of Senator John McCain until sunset, September 2. Republican governors that have announced that they have lowered flags until McCain's burial include Florida Gov. Rick Scott, Iowa Gov. Kim Reynolds, Maryland Gov. Larry Hogan and Kasich. Maryland flags will remain lowered through sunset on the day of Senator McCain's interment. Alaska Gov. Bill Walker, an Independent, ordered flags lowered in the state until sunset on Friday, August 31. Walker said in a statement released Monday that he and his wife Donna are "deeply saddened" by McCain's passing. (Paul Vernon/AP, FILE) Ohio Gov. 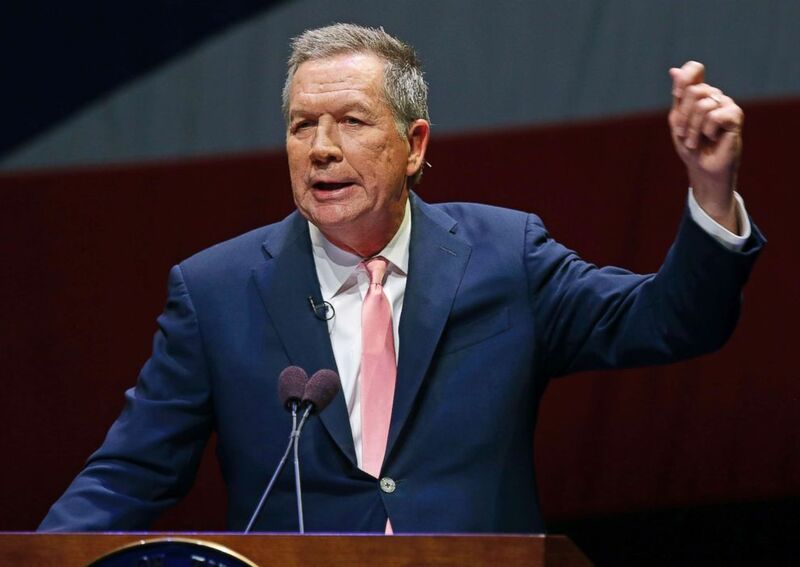 John Kasich speaks during the Ohio State of the State address in the Fritsche Theater at Otterbein University in Westerville, Ohio, March 6, 2018. "We respect that his actions were guided by what he believed was best for the people he represents, rather than what would advance his personal political goals," Walker said. Follow President Trump's statement and decision to lower the White House flag until McCain's burial, several governors quickly followed suit. 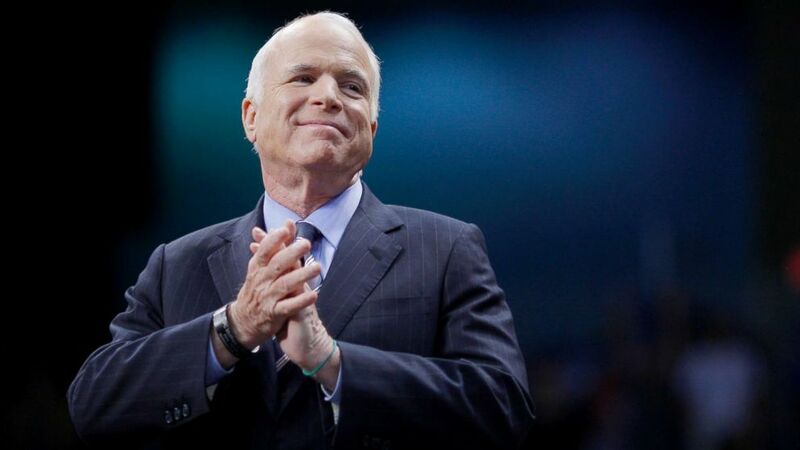 Republican governors including Mary Fallin of Oklahoma, Pete Ricketts of Nebraska, Dennis Daugaard of South Dakota, Phil Scott of Vermont and Jim Justice of West Virginia all issued statements and proclamations saying state flags would be lowered until McCain's burial. Arizona's Republican Gov. Doug Ducey ordered flags lowered to half-staff over the weekend. A representative from Ducey's office did not respond to a request for comment on how long flags in the state would be flown at half-staff.